Other than the big race, Le Mans is also known for the many parades that happen during the race week. It's also possibly the only time during the entire race week that fans actually get a chance to catch a glimpse of their favourite drivers. They otherwise keep disappearing at the blink of an eye, don't they? But during the parade laps, things slow down. The drivers are driven around slowly so they can wave to fans, toss them a few freebies and also sign an autograph or two. While the drivers' parade at Le Mans is exactly that - a parade for the drivers in which they are taken around the heart of Le Mans town in vintage cars so they can greet their adoring fans; there are other parades that happen just ahead of the race start. These parades feature classic Le Mans race cars that have raced at the Circuit de la Sarthe in the past, and other cars that are driven on the track to commemorate a special occasion. In this case, the special occasion was the 100 years of Aston Martin, and given that we were a part of the Gulf Aston Martin team for that weekend (read about our pit crew experience right here) we were lucky enough to be a part of it. 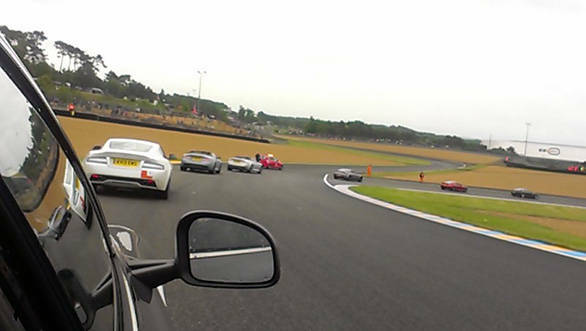 So, I found myself standing on a part of the Bugatti circuit, looking at an Aston Martin Rapide that I was told I'd get to sit in. Piloting the car was John Muirhead, Aston Martin's Head of Brand Communications, and, at the age of 65, still an active part of the British Club Racing scene. And then the parade started. 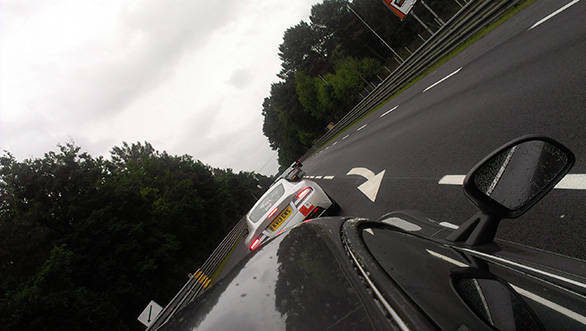 Led by the Aston Martin CC100, the cars made their way out of the Bugatti Circuit and onto the Circuit de la Sarthe. Along the way the marshals stood by, waving to us as we motored past. The crowds weren't all in yet - given that the race starts at 3:00pm, expecting them to show up for a parade at 10:00am was a little optimistic. Not that it mattered to us one bit - we went down the Dunlop Curve, into Tertre Rouge and then down that fabled never-ending Mulsanne Straight. The best part of the circuit, however, was at Arnage, just before Indianapolis corner - I'm wondering how on earth the drivers manage to take these corners at the speeds at which they do. Then we head down through the Porsche Curves, past New Maison Chicane, before finally entering Ford Corner and heading down the start finish straight for the last time. It takes us a good 20 minutes for the entire run - you see we weren't traveling at racing speeds. But it was fascinating nonetheless. 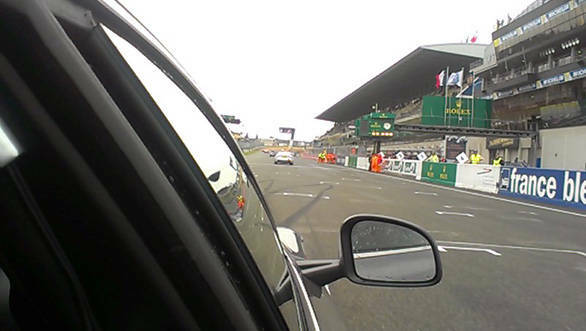 After all, it isn't everyday that a girl gets a ride on the Circuit de la Sarthe!